The Return of Persephone (1891), by Frederic Leighton (1830–1896). Leighton depicts Hermes helping Persephone to return to her mother Demeter after Zeus forced Hades to return Persephone. The second night of the speaker event series Brooklyn Dirt: Monthly Talks on Urban Garden and Farming is this Wednesday, March 16. The topic is Garden Design. 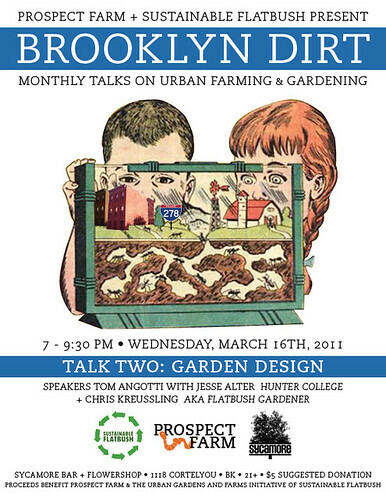 Prospect Farm and Sustainable Flatbush are proud to present Brooklyn Dirt: Monthly Talks on Urban Farming and Gardening. $5 suggested donation. Proceeds benefit Prospect Farm and the Urban Gardens and Farms Initiative of Sustainable Flatbush.